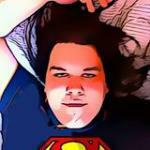 There are 15 posts in this thread, and it has been viewed 21385 times. There's also files attached. What's your opinion on this weeks Game of the Week, Cyber Lip? Game FAQ attached - see the end of this post. Do people want me to attach FAQ's to these threads more often? NOTE: This was a previous GotW thread! What do you get when you cross Contra with The Terminator? Cyber Lip is the answer. A malfunctioning military computer that is in charge of all military androids must be stopped from taking over the world. Our diagonal shooting impaired heroes, Rick and Brook, step in to take it down. 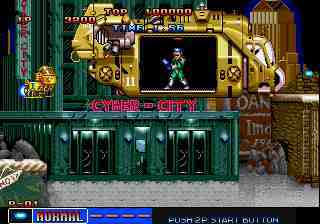 Cyber Lip is an old game, but considered to be a classic by many, and it definitely looked impressive for its time. 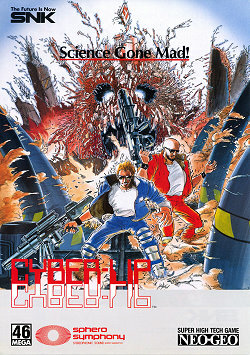 Apparently ex Irem members worked on this game, and they went on to work on Metal Slug. 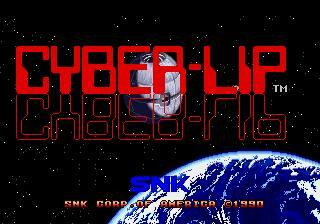 Whatever your opinion on Cyber Lip it should still be seen as an important title; a stepping stone towards said game. 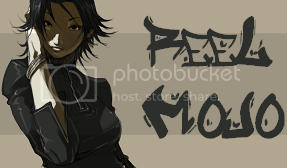 Cyber Lip music available in the SNK Jukebox! We are running a high score challenge on Cyber Lip! Check out our high score challenge forum for more info if you think you can set a high score in the game! I really like the style of this games some of the alien enemy sprites look really good and I think Metal slug creators got some inspiration from this game too. The game can be really difficult at times. But with infinite continues as this game has, anyone can finish it. You do however lose your score once its Game over. The cover art is really appealing too IMO. I don't have this game, but I've been watching the video footage - it does look a lot like Contra! I really like the end of level boss - I've seen a screenshot of him before - but I never knew where it was from - until now. It does look a little dated gfx wise, but I would definitely like to play this game one day, to see how it plays. 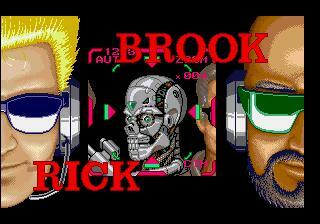 I love that it has the classic white-guy black-guy buddy system too - like all games in the early 90s. I have never played this game but would be interested in buying it if I saw it cheap somewhere as I love run n gun games. Looks like it could be fun in 2 player mode. The storyline is very different from what anyone would expect. When I first heard of it, I was expecting it to be another fighter or shooter, but a platformer is an occasional genre for in Neo-Geo. The doors you enter to take a reload are quite a relief. 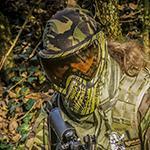 My favourite weapons are Automatic pulse gun, the Flamethrower and the Bazooka. The Spreader and the grenades are no good to me. The best part of the game, is that its one of the few Neo-Geo games to contain dialogues voiced. I have yet to play this one. I'll have to try it out because I love Metal Slug and if this is a precursor to that series then it's a very important part of gaming history. It's charming in a way, with the hilarious Engrish and everything... But i would have felt so cheated if i'd have paid �200 plus for this when it came out when i could have bought far, far superior run n' gun shooters like Contra 3 or Gunstar Heroes for a quater of the price. Sorry guys, but along with the likes of Magician Lord, Burning Fight and Blue's Journey, this is one of those arly Neo Geo stinkers if you ask me. I haven't played it yet, but from what I've heard and seen so far, it seems to be a horrible contra-rip off. I won't buy it, I won't even play it, it doesn't look like fun at all. I mean, look, it doesn't even have diagonal shooting! 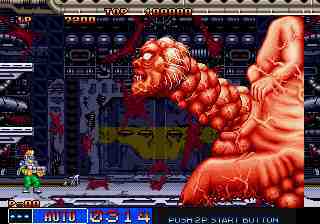 they also stole the first contra 3/super probotector boss. and now, after I cursed this game, let me turn around and shiver in disgust. ps:at least I won't vote in the poll. I haven't played it, so I can't judge it right. Cyber-Lip is alright in my book. Sure there are WAY better titles out there, but for the price it's a good little game to start out with. 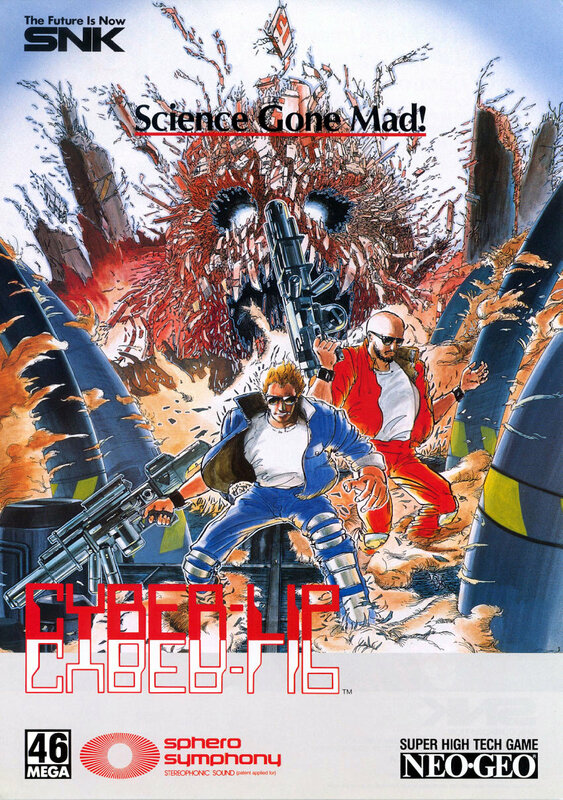 Would I have payed full price for Cyber Lip back in the day? Hell no. I've never actually played this to be honest I'll have to give it a try later. This game is an okay shooter but I wouldn't put it in the same league as Metal Slug. It has a nice cartoony style that works well even with the rather limited graphics and it plays pretty well too . The alternate paths and the sort of jet ski that you can use for a while upon respawning are nice but the alternate weapons mostly feel a bit redundant. The best part I think is the cool ending while the worst part would be that a mere Snes ccould easily outdo this title in terms of graphics which is rare for the format. Overall it's a nice title and it usually comes with an affordable price tag as well but I would pick several games (including Magician Lord, 8 Man and any Slug) over this one. I really don't know what to think of this game...now the graphics are quite dated, but then again they might have been pretty good when the game first came out. Even though the fun factor is high at first, but this game doesn't hold my attention for very long so I get bored with it. I guess it's not a bad game, and even though I don't like to compare different games with each other, I have to say that I prefer Contra the Hard Corps and any Metal Slug game over this one. Its quite repetitive and a bit clunky to play control wise, but its a pretty good game.